Please help build a freshwater well in honor of Dr. Bob & Betty Anderson. 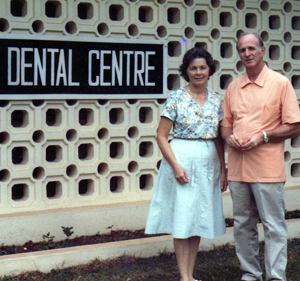 After retirement, Uncle Bob & Aunt Betty spent 15 years doing medical and dental work in Ghana & Nigeria. The Andersons have touched many lives with their service, and I hope that by building this well, many future lives will be inpacted. Dr. Bob Anderson passed away at home on March 16, 2011. He will be greatly missed by his many family and friends. 03/20/11 Floyd & Jo Ann Greenwell $500.00 The footprint he left on this world will reamin for many, many years. 03/18/11 Sheri Ahrens $100.00 He was an example to us all. He will be missed. 01/26/11 Linda Knott $100.00 God bless these faithful servants, Bob & Betty Anderson. 01/20/11 Claire Metzloff $25.00 What a great way to honor my grandparents! !